Each month, Miranda van den Heuvel talks to creative people in Luxembourg and says “look, Luxembourg is creative! 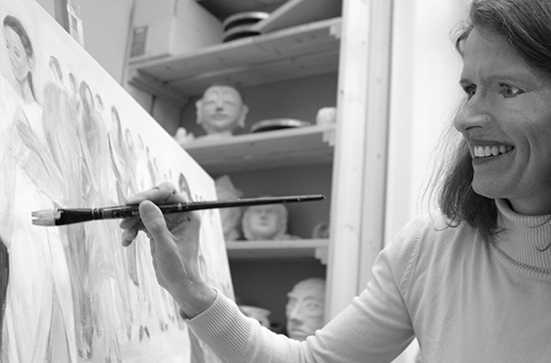 Here’s how and where!” The February talk is with artist and architect Rikke Hannibal. That is really a big question. To me creativity is when I get an imaginative idea and can’t wait to transform it into reality in a painting or a building. There are people who spent lots of time studying what creativity means but for me it’s quite simple. I can be creative when I go for a walk through a crowded train station or swim endless lengths at the pool and think of an idea that I have to go home and put into reality. I am an architect and a painter. Through my architectural studies, I have learned to express my ideas through drawings and illustrations. As soon as an idea pops up in my head I start drawing. A professor at the university I studied always said: “I don’t care how many ideas you have in your mind, if you can’t illustrate them, they’re not worthy as ideas”. So that’s what I did and actually have been doing since I was a child. I also find great joy in visualizing my ideas through architecture. I used to build models to help me see my concept in 3D whereas now I can imagine my ideas three dimensionally and then create them on the computer for everyone to see. Traveling is essential. During my career I have worked in Denmark, Switzerland, Germany, and finally Luxembourg. The Duchy has a wonderful international atmosphere with cultures from all over. Our house is in the middle of a multicultural part of town, and I find it an exhilarating surrounding. Since kindergarten, colours have been a passion and I was conscious of matching and contrasting colours. These days, I typically use pastels to represent the idea of light and luminosity. And, influenced by the modernists, my architecture and design are full of open spaces and big windows or openings. This reflects the strong need, as a Scandinavian, for a natural light source during those long winters and short days. In my own home I have experimented with lights and colours and have spent a lot of time and energy in finding just the right light for the various zones in my house. I can’t say which is my best work because it is a matter of mood and taste. Some people like my watercolours of buildings or people whereas others prefer my acrylics which often represent people or feelings. My favourites, though, are ‘The American Soldier’ and ‘A Broken Dream’. Left: The American Soldier. Right: A Broken Dream. Rearrange the furniture in your house and see if you have used the space in the most creative, useful way. It helps to get a different perspective. You may find out that it is just right the way it is, but maybe there is another way of looking out,or a different view. Take a photograph from another angle: maybe lower, maybe tilted? Does it work, is it good? A change of setting is always refreshing. I don’t use websites for inspiration. I get my inspiration from ideas that come into my head. ‘A Broken Dream’ (the Ballerina) was created because I dreamt of being a dancer, but my parents didn’t see the purpose. I wanted to paint the disappointment I felt and so I searched for a photo of a ballerina tying her shoes because I can almost feel her agony of not having received the part she dreamt of. When I saw the exhibition “The Family of Man” many years ago in Luxembourg, I was so fascinated by the photographs that I ended up painting three paintings from black and white photos shown in the exhibition – ‘The American Soldier’, ‘The Swing’, and ‘The Game’. Later the exhibition has been renovated and appears in stunning settings with the most grasping stories told through the photographs. Other times I paint “on site” or I paint from a picture I have taken or a photo I have searched to follow an idea of a theme or specific setting. ‘Dance Fever’ was a collage of various photos that I put into a composition. Definitely go see the exhibition “The Family of Man” in Clervaux Castle. The fairytale like setting of the castle with all its brilliant photos shouldn’t be missed. I could go again and again and really enjoyed the guided tour after the castle reopened following renovations. “La Philharmonie” is another must, It is interesting architecturally and has an inspiring, dynamic atmosphere with its different views. Go for a walk through town and have a look at all the different people and nationalities. I love studying people and their expressions, and sometimes wish I could have a hidden camera to capture all the moods and feelings of random people on the street. Or take the train where you can people watch and guess life stories… where could they be going next? Sometimes I’m inspired to paint a character I’ve seen on a random day in a cityscape. I don’t really know how to answer this question. I wish there were more artistic workshops and places to meet other artists. I am currently looking for a place to paint as my house is a bit small for my recent bigger paintings. Like what you see? 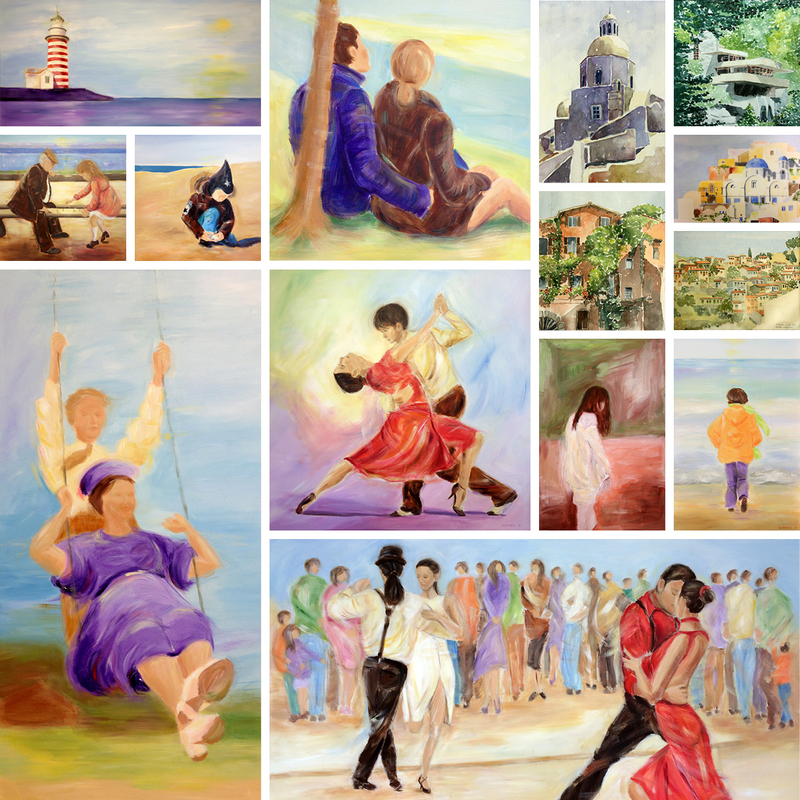 Some of Rikke’s paintings are for sale. For more information, visit her website www.hannibal lu. We were delighted to have Rikke as an exchange student in Michigan (USA). One of her paintings of a sailboat is hanging in our home. We had taken her sailing within 48 hours of her arrival! Rikke always appreciated the arts but we had no idea how prolific she had become. May you all get to enjoy her works!